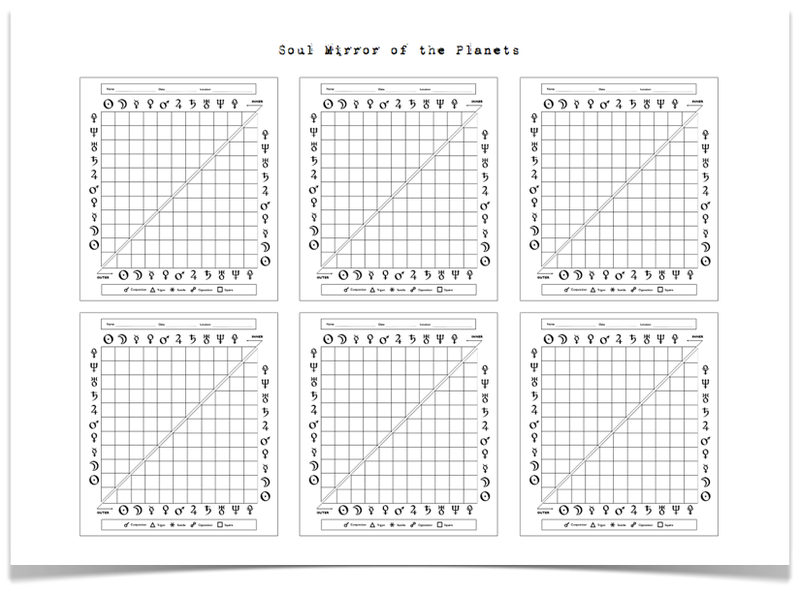 The Soul Mirror of the Planets is a technique I developed based on the original Soul Mirror of the Elements as well as my own magical and astrological practice. It is just as simple as the original technique; yet instead of previous knowledge of the four elements it requires a basic familiarity with the foundations of astrology. Once this is in place I experienced it to be a wonderful tool to bring the planets to life within ourselves. What we get to see in the Soul Mirror of the Planets is not a static image, but a glance at the living current of our own being. This current doesn't stand in isolation but is deeply embedded and an integral part of the world around us. Thus our inner qualities participate in the tides of nature. As a microcosm of nature humans hold a piece of every being ever created within themselves. Thus our inner qualities do not only represent the elementary beings that reside below the sphere of the moon yet they extend far beyond this - and include all the influences of the planets and celestial realms. So once we have mastered the practice of the Soul Mirror of the Elements it is time to take the next step - and to understand the qualities and patterns of power that are guided by the planets within us. Traditionally astrology is the art and science of understanding and interpreting the influences of the stars on our lives on earth. Thus attention and understanding moves from the outside in: first one aims to understand the nature of the planets, the houses, the aspects and the signs of the zodiac. Only then can one advance to the next level and apply what has been learned to the inside, i.e. one's personal life or the lives of others. Even once a fundament of knowledge has been built, however, the focus moves from the outside in: first one looks at the stars and their specific constallations, then at how these relate or could relate to a specific situation in the present, past or future. Of course this is a perfectly fine approach and has proven to be helpful in mastering one's life for millenials. However, if this is how one approaches astrology it will always remain one thing - and that is a monologue: A life long monologue of stars talking at us, of influences flowing downwards in the neo-platonic chain of being to us, of humans and plants and animals eternally exposed and directed by the powers and tides of the celestial bodies and beings. In many cultures the privilege of challenging this balance of power was reserved to the rites of ritual magic. Only when summoned and approached in ritual trance was a direct communion or communication possible with the intelligences and spirits of the celestial realms. While this is progress and at least opens small windows of dialogue for short periods of times - confined through ritual preparations, incantations and shifts of consciousness - it still didn't allow for a continued conscious contact between us and the planetary beings. Tearing down this divide between our day-to-day consciousness and our awareness of and ability to interact with the planetary forces behind it, is the goal of the Soul Mirror of the Planets. Of course this technique can only be a first step. A tiny first step, you may want to think, compared to the strength and thickness of mental structures established over centuries. Yet, at least it is a first step in breaking through the barriers of outside and inside. How far it will take each one of us on our journeys will be determined by how many small steps we are prepared to align in a sequence. This is how long journeys are travelled. To embark on this journey one first needs to familiarise oneself with the human constitution according to Gnostic Hermetism. The main premise of this interpretation of the Gnostic teachings is that our subtle bodies are actually made up of spiritual beings in their own rights. Thus our ethereal, astral, mental and planetary bodies all form hive beings which in their totality create the hive being that we call our incarnated self. What this paradigm does is it turns us into truly living microcosms: We become a dwelling of all beings present around us, some in form of sleeping sparks and some in form of full grown adult beings... All the forces of the elements and the celestial planets are no longer influencing us from the outside, yet they constitute our very being through subtle organs that all carry individual consciousness on their own. And this is how we can start to turn what used to be a monologue for millenials back into a dialogue. If all these living beings are already present within ourselves, let's simply learn to listen and distinguish their voices from the chatter of emotions, of thoughts and feelings, of moods and experiences we are thrown into every single day. To understand the stars and their influences upon us one has to look as much inside oneself as one has to look up to the sky. Here is how we can do this by use of an alternate version of the original Soul Mirror. PHASE 1 - LISTENING: Every night we sit down and reflect on the day passed. Which moods, emotions and experiences did I encounter? Which spirit voices did I hear within me? When was I able to listen and when were my inner senses numb? By asking these questions we will over time establish an awareness of our inner choir of emotions, thoughts and experiences. The crucial point here is NOT to identify with any of these experiences, but to look at them from a distance - just like we would look at the planets on a birth horoscope. PHASE 2 - THE PLANETS: Once we start to hear and differentiate these voices we can take the next step. Now we compare what we have heard inside of us with the nature of the planets. To accomplish this a solid fundament of astrological knowledge is necessary. The vocabulary we need to learn is this: how does the pure voice of Mars sound like when experienced from the inside? How do the voices of Venus or Jupiter compare to it? We need to sharpen our ability to observe and work with these forces by getting to know them on a highly intimate level - inside ourselves. PHASE 3 - THE ASPECTS: Next we need to teach ourselves knowledge and understanding of the astrological aspects. No true inner or outer astrological work can be achieved, unless we have established a strong understanding of how the voices of the planets sound once they speak to us in choir. Think of each voice of the planets as a pure sound. You start by listening to and becoming able to hear these specific sounds individually. Only then do you progress to create melodies from them by mixing and mingling their vibrations. It is these melodies and rhythms that make up the constitution of our emotional and mental bodies. It is the music of the planetary spheres that we are veiled in - and made of ultimately. And it is this music that we need to hear again - before we are able to sing back at it. Once you have a thorough understanding of the planets and the astrological aspects you can start with the practice of the Soul Mirror. As you have seen for anybody familiar with the basic elements of astrology this will mean relatively little to no preparation. The main difference to traditional astrology is the cognitive shift to understand the planetary influences as inner voices or melodies rather than outer ones. Sitting down at night and reflecting on the day you use a print out of either Template 1 or Template 2 (see below). What you have here is a simple, blank list of all possible aspects of the planets. If you want, this is the empty sheet of music on which you need to mark down the melodies you heard inside yourself today. So you mark down any aspect of plantery influences you think (!) you have experienced over the course of the day. A few examples: 'This troubled car drive today which melody was hidden in it? Did I react aggressive or fearful, which emotions and voices were present in my body? Was it an influence of Mars being in a square with Saturn? Or was the experience dominated by the irrational fear the world would end if I came too late to my appointment - and thus I heard the voices of Moon and Pluto in opposition?' This deciphering or translation process is what matters most and needs to be learned in small steps. What did I experience within me, which keys were hit, which strings were resonating and thus what was the melody life played through the resonance body I call myself? Note that we deliberately do not look at the influences of the houses for this exercise. It doesn't matter for an accurate Soul Mirror wether the experiences were made while reading a book, while cleaning the kitchen at home or while being in the office. The theatre stages of life on which the melodies are heard don't matter for the intent of this exercise. We just close our eyes, forget about the stages and sceneries and rewind the day - while listening to our inner experience of the play. Once we have filled in the possible aspects experienced, we can progress and use a free astrology software online to calculate the actual aspects and transits of our chart of the day. These can be filled in the lower, right hand side triangle of planetary aspects for each day. What we end up with are two astrological aspect tables of the day: One mapped out from our inner experience, the other mapped according to the outer influences of the stars. The real value in doing this exercise every day lies in the learnings that come from comparing these two charts. This is how we train our ability to hear and listen and distinguish the voices of the planets and their melodies within us. When I started to fill in this sort of Soul Mirror for myself I made some interesting observations which I want to share with you as a final point. For most days there were only one or two 'melodies' I remembered consciously. Rarely did I recall more than two intense emotional states over the course of a day that left a mark on how I felt or the mood I was in. Maybe this is just me not being a very good listener yet? Yet, it helped a lot in finding my way through the maze of actual astrological aspects in my present day chart. I simply looked at the ones I was ready to listen to from the inside, the rest I glanced over only briefly. In the best case what this practice can give you is a sense of yourself as a sequence of sounds and melodies. Your mind is made up of these, your emotions are, even your physical body is constituted by these singing voices and the choir that they form... In the worst case it will teach you thoroughly about the nature of the planets and their astrological aspects from a slightly different point of view.